When night begins to fall on the sleepy town of Woodinvale, the shadows and fog rolling in bring with them more than just a chill shiver. A living nightmare erupts as the once peaceful community is overrun with the restless deadâ€¦scratching and clawing their way to the surface with an insatiable hunger for human flesh. Now only a handful of unlikely Heroes are left, banding together to fight for their very lives. On a night that never ends, the only thing worse than deathâ€¦ is becoming infected. Last Night on Earth, The Zombie Game is a fast-paced game of brain-eating Zombies, small town Heroes, and horror movie action. Players take on the role of either the Heroes, working together to make it through the night; or the Zombies, unending waves of undead spreading over the town like a plague. Featuring a modular board, eight Heroes to choose from, and several different Scenarios to play that drastically change the game, Last Night on Earth is designed to create a cinematic feel as the story and game unfolds. So put down that popcorn, grab your shotgun, and hide your brain; the Zombies are coming and this could be your Last Night on Earth! 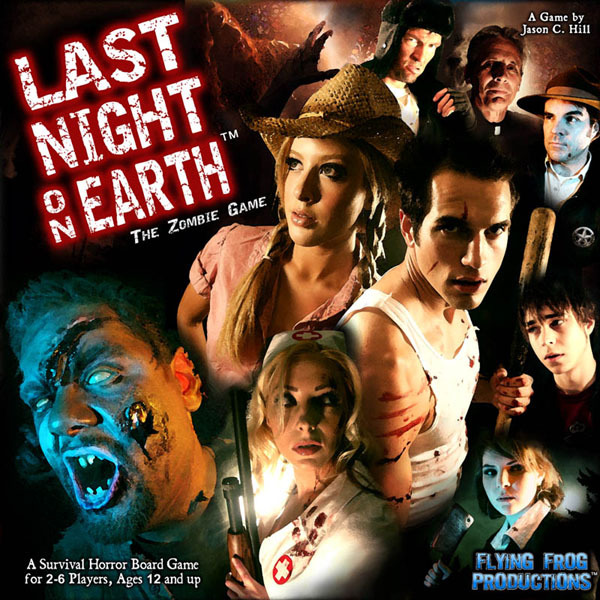 Other products in the "Last Night on Earth" series. This is an amazing game, it does not take long to play, the rules are easy to pick up. This is the best Zombie game I have played and has a lot of depth possible. Most people will enjoy playing this game. This game plays out like the best zombie movie ever made. Players choose roles like the Drifter or the high school quarter back and fight zombies. The game is highly replayable because there are different missions to play and many expansions. LNOE has unbelievable depth, and it just seems like they've thought of everything. The production value of the game is superb. Plays well with as low as 2 and as high as 6 players. Enjoy! Lots of stragey and laughs during every game! Its always fun to hide in a house and hold out with only a flaslight and a flare gun! One of the first non traditional board games I ever played. Great game with many people, best played with 5. This is by far the best zombie themed game I've played. It's well-constructed, highly replayable, and above all fun. Last Night on Earth even comes with a soundtrack - how many games grant that? Here's something for people who whine about pasted-on themes - this game is all about the setting, and it's as fun as your favorite horror film. Great game, glad I finally got to play it. Playing the zombies was a hoot. Everyone who played enjoyed it. Unabashedly old school in every way. Great theme, incredible production values. This one's going to be a classic. If you like A) Zombies B) A fun teams based game C) Dice rolling/stats based gameplay and D) varialb objectives/re-playability then look no further! LNOE is an extraordinary game and tons of fun. I can't get enough of this game! This game rocks! It makes me feel like I'm in a B-rated zombie movie. It is very fun to play as either the zombies or the heroes. The mechanics of the game are easy to learn and understand; they are not as clunky as some other zombie games out there. A defininte buy if you like zombies. If you're looking for a zombie game with high quality components, a great game system, and awesome theme...you must buy this game! While it lacks the random board of a system like the Zombies games, it more than makes up for it with a superior game system and tons of character!